Who uses NASA Earth science data? Dr. John Wilkin, to study coastal ocean circulation, marine ecosystem processes, and the occasional rock lobster. 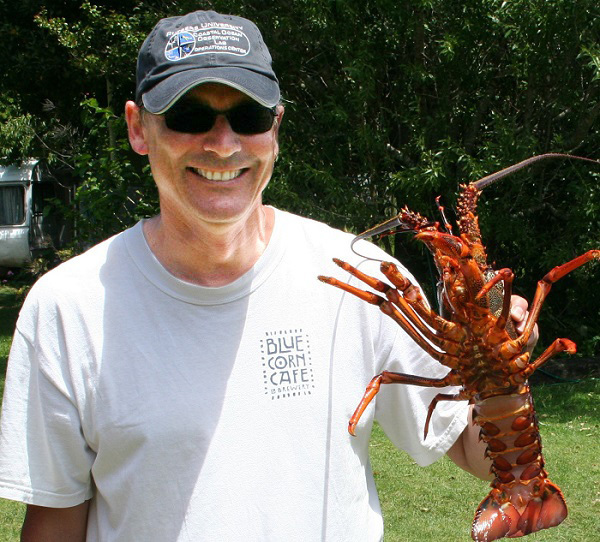 Dr. John Wilkin holding a Jasus edwardsii, commonly known as the southern rock lobster, New Zealand crayfish, or koura. Image courtesy of Dr. John Wilkin. Research interests: Ocean simulation modeling, data assimilation, and remote sensing of estuaries, the coastal ocean, and the deep sea adjacent to the continental shelf to study nutrient and carbon cycling, larval dispersal, and ocean transport, weather, and ecosystem forecasting. Research highlights: The rock lobster is responsible for some of Dr. John Wilkin’s first work with satellite data. As a scientist at the Commonwealth Scientific and Industrial Research Organisation (CSIRO) in Australia, Dr. Wilkin was part of a research team that estimated ocean surface velocities from satellite sea surface height data to chart ocean current variability in the eastern Indian Ocean. The research team used these data to simulate how ocean currents affect the dispersal of rock lobster larvae from spawning locations off the west coast of Australia. Dr. Wilkin conducted additional work in New Zealand on lobster larva dispersal in the Tasman Sea along with studies into ocean current estimation using sequences of ocean temperature imagery before joining the faculty of Rutgers University in 2001. Dr. Wilkin’s current research using remotely-sensed satellite data covers a wide range of topics, including nutrient and carbon cycling; ocean transport, weather, and ecosystem forecasting; and continued investigations into larval dispersal. As Dr. Wilkin and his co-authors note in a recent paper, satellite remote sensing plays a vital role in oceanography. The use of satellites to measure the height of the ocean surface through a technique called radar altimetry is a key technique in operational oceanography. Altimeter satellites, such as the European Space Agency’s Sentinel series and the joint NASA/NOAA/European Jason series, provide high precision, high resolution sea level data along the satellite track. In addition to sea surface height, satellites are valuable for measuring and monitoring sea surface temperature, ocean color, sea ice, surface winds, sea surface salinity, and waves. Data from many of these satellite missions are available through NASA’s Physical Oceanography Distributed Active Archive Center (PO.DAAC). Dr. Wilkin’s current research integrates satellite and in situ ocean observation, simulation, and analysis to study the role that ocean physics plays in weather, climate, ocean transport pathways, marine environmental health, and ecosystem functioning in the coastal ocean and adjacent deep sea. He also is involved with the international Ocean Surface Topography Science Team (OSTST), which is a group of interdisciplinary scientists using satellite altimetry data to study ocean processes. Much of Dr. Wilkin’s research focuses on the Mid-Atlantic Bight and Gulf of Maine regions of the northeast U.S. continental shelf, which is an area delimited by Cape Hatteras, North Carolina, in the south to Halifax, Nova Scotia, in the north (a “bight” is the name given to a bend or curve in a coastline or a bay formed by this sort of curve). In addition to remotely-sensed satellite data, this area also has a rich collection of data gathered by sensors, buoys, and other ocean-based instruments that are available through the Mid-Atlantic Regional Association Coastal Ocean Observing System (MARACOOS) and the Northeastern Regional Association of Coastal Ocean Observing Systems (NERACOOS), which are regional associations of the U.S. Integrated Ocean Observing System (IOOS). Dr. Wilkin uses the same modeling system, but without data assimilation, to drive biogeochemical and ecosystem models of the region to simulate nitrogen and carbon cycling as well as to assess primary productivity. Primary productivity refers to the production of energy, typically through photosynthesis, by organisms that form the base of the food chain. In fact, ocean primary production in the continental margins studied by Dr. Wilkin comprise as much as one-fifth of global marine primary production. In a recent study, Dr. Wilkin and his colleagues used an integration of satellite data and ocean model products to study changes in dissolved organic carbon (DOC) in the Mid-Atlantic Bight. DOC is one of the greatest cycled reservoirs of organic matter on Earth, accounting for up to 20% of all organic carbon. As noted by Dr. Wilkin and his colleagues, 50-70% of the global transfer of organic carbon to the seabed occurs in continental margins, with DOC accounting for up to 90% of organic carbon in the coastal ocean. The study includes data from the Moderate Resolution Imaging Spectroradiometer (MODIS) instrument aboard the Aqua Earth observing satellite and the Sea-Viewing Wide Field-of-View Sensor (SeaWiFS) aboard Orbital Sciences Corporation’s SeaStar spacecraft (which is no longer reporting data) along with data collected from numerous study sites and stations along the Mid-Atlantic Bight. These data were analyzed using models to produce vertical profiles of DOC. Among their findings, the research team notes that their approach of combining satellite observations, field measurements, and model results provides a good overall assessment of DOC stocks and changes in DOC in the continental shelf. In fact, the integration of remotely-sensed data with model results is essential for capturing the DOC variability observed in the Mid-Atlantic Bight over monthly, seasonal, and interannual time scales. Mannino, A., Signorini, S.R., Novak, M.G., Wilkin, J., Friedrichs, M.A.M., & Najjar, R.G. (2016). “Dissolved organic carbon fluxes in the Middle Atlantic Bight: An integrated approach based on satellite data and ocean model products.” Journal of Geophysical Research: Biogeosciences, 121(2): 312-336 [http://doi.org/10.1002/2015JG003031]. Le Traon, P.Y., Bonekamp, H., Antoine, D., Bentamy, A., Breivik, L.A., Chapron, B., Corlett, G., Dibarboure, G., DiGiacomo, P., Donlon, C., Faugère, Y., Gohin, F., Kachi, M., Font, J., Girard-Ardhuin, F., Johannessen, J.A., Lambin, J., Lagerloef, G., Larnicol, G., Le Borgne, P., Lindstrom, E., Leuliette, E., Maturi, E., Martin, M., Miller, L., Mingsen, L., Morrow, R., Reul, N., Rio, M.H., Roquet, H., Santoleri, R. & Wilkin, J. (2015). “Use of satellite observations for operational oceanography: Recent achievements and future prospects.” Journal of Operational Oceanography, 8: Iss Sup1, s12-s27 [http://doi.org/10.1080/1755876X.2015.1022050]. Griffin, D., Wilkin, J., Chubb, C., Pearce, A. & Caputi, N. (2002). “Ocean currents and the larval phase of Australian western rock lobster, Panulirus cygnus.” Marine and Freshwater Research, 52(8): 1187-1199 [http://doi.org/10.1071/MF01181]. Wilkin, J., Bowen, M. & Emery, W.J. (2002). “Mapping mesoscale currents by optimal interpolation of satellite radiometer and altimeter data.” Ocean Dynamics, 52(3): 95-103 [http://doi.org/10.1007/s10236-001-0011-2].